Mark Hamill and James Gunn discussed possibly working together for Guardians of the Galaxy 3 on social media. Gunn announced over the summer that he had finished the first draft of the script for the third and final movie in the trilogy and it's in the very early stages of development at the moment. Rumors indicate that production could begin in early 2019 with preproduction having reportedly already started. There's still a lot of time to cast the new roles and Mark Hamill might end up in Guardians of the Galaxy Vol. 3 when all is said and done. 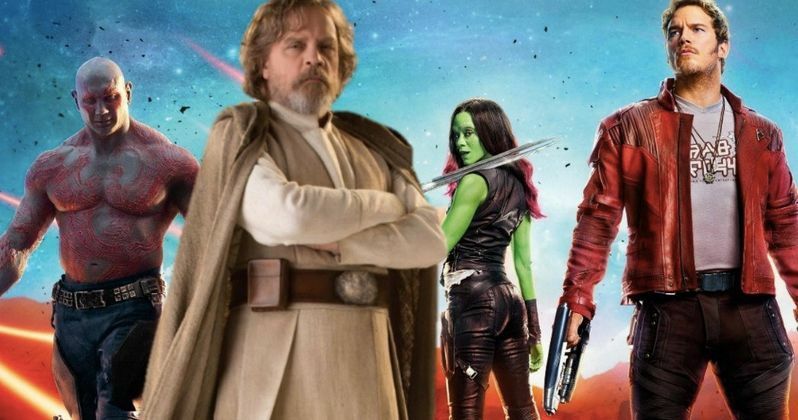 The talk of Mark Hamill joining the Marvel Cinematic Universe all started on Twitter when a fan reached out to James Gunn to suggest Hamill for Guardians of the Galaxy Vol. 3. Both Gunn and Hamill are pretty active on social media and the director responded by lightheartedly proposing that he and Hamill get together and discuss since they live in close proximity to each other in Malibu. Not long after, Mark Hamill chimed in and said, "I would be happy to do so, both as a good neighbor & an unemployed actor." James Gunn laughed at Mark Hamill's joke of being unemployed and said that they should meet up, to which Hamill asked the director to send over his contact info. The idea of Star-Lord and the man who portrayed Luke Skywalker on the big screen together for the MCU is almost too much for fans to take, even if it's just a cameo. Even actor Josh Gad got super excited about the prospect in the same Twitter thread. James Gunn is notorious for jamming the Guardians movies with secret and not-so-secret guests and Guardians of the Galaxy Vol. 3 will presumably be no different. Guardians of the Galaxy Vol. 3 is still a long time before it's released in 2020, so it seems that a Mark Hamill appearance isn't out of the question, especially if his schedule lines up. If the actor is going to be in Star Wars 9, production for that begins this summer and Hamill would be finished in time to start working on whatever James Gunn has prepared for him. However, it's important to note that this was just a lighthearted social media exchange, albeit an exciting one. Mark Hamill seems like a perfect fit for the Guardians crew with a large role or even as a voice actor for a smaller role. Hamill got his first taste of motion capture work on The Last Jedi when he asked Rian Johnson if he could voice a character on Canto Bight, so he could show up in Guardians of the Galaxy 3 in a secret role that would have fans guessing, which seems like something he and James Gunn would do. We'll just have to wait and see if these two neighbors end up working together. You can check out the humorous exchange below, courtesy of James Gunn's Twitter account.